[Book excerpt] The following piece appears in the anthology 'An Uncivil Woman: Writings on Ismat Chughtai' by Rakhshanda Jalil. Ismat Chughtai was my cousin Azra Hyder’s classmate in Aligarh Girls College, perhaps around 1938. In those days co-education meant that a screen was placed in the class, and girls attended the lecture from behind it. Ismat Apa’s short story, "Parde ke Peeche" (Behind the Curtain), about this period, was a rather innocuous sketch of the fun, laughter, and witticism that went on behind the screen. However, very soon "Parde ke Peeche" became a metaphor for Ismat’s work. This was because she dared to raise the veil of hypocrisies in Indian society. She came to be known as a rebellious woman and she was overjoyed and entertained by this status. She knew the art of shocking people and opposing traditional values. Dr Rasheed Jahan, a medical practitioner, also from Aligarh, became a member of the Communist party. Her younger sister, Khursheed Jahan, joined Bombay Talkies in 1937 and became famous as "Renuka Devi". Her sister-in-law, Shahida Abdullah, adopted "Neena" as her screen name. Today, these facts may seem unimportant, but 50 or 55 years ago this was a very bold step. Ismat Chughtai belonged to this generation. During this period, women writers in Urdu wrote either reformist short stories or romantic fiction for magazines such as Zaibunnisa. (Some of these were very good: Hijab Imtiaz Ali is a separate chapter in Urdu fiction, whose mention falls outside the scope of this sketch.) At this particular juncture, Ismat Chughtai exploded like a bomb in the literary field and, as the saying goes, "the rest is history". Her first collection of short stories was perhaps either Chotein ("Wounds") or Kaliyan ("Buds") — I don’t remember — published probably in 1941. Ismat Apa saw many ups and downs in life. I met her for the fi rst time in Bombay in 1956, when she and Shahid Latif were at the peak of their film career. She would write the script and Shahid would direct the fi lm, and every fi lm was a hit. I remember two of them, Ziddi ("Stubborn") and Buzdil ("Coward"), and another, Sone ki Chidiya ("The Golden Bird"), which was probably based on Nargis’ life. Even during this period, she wrote some good short stories. However, I think it is from then on, due to her involvement with script writing, that her artistic control over the short story form weakened slightly. Her style slackened somewhat. Ajeeb Aadmi ("A Strange Man") and Masooma reflect the influence of film gossip on her style. However, Ismat Apa will always be remembered for the valuable stories she has contributed to Urdu fiction. I believe that the criterion of a good short story is that one should want to read it more than once. Some short stories of Manto and Ismat are of this standard. Sometimes, I would call her "Lady Chenghez Khan" because, in the battlefield of Urdu literature, she was a "Chughtai" — an equestrian and an archer who never missed the mark. The spontaneity and the delectable flavour of the language found in her short stories came from the language she and the other women of her family spoke. Their language was very picturesque and full of wit and repartee. Ismat Apa was an affectionate, outspoken, frank, stubborn, and witty woman. Once, a newlywed woman at a party, in complete Mughal regalia (Mughal-e-Azam was a rage then), reclined on a sofa striking a Madhubala pose. Whoever passed by stopped to stare at her. Just then, Ismat Apa appeared on the scene and theatrically announced, "Anarkali, here I come!" At Jan Nisar Akhtar’s demise, there was a lot of lamentation, and a woman who called herself his sister was prostrate with sorrow. Another woman wailed, "Bring the widow! Break the widow’s bangles." For a while Ismat Apa observed her silently. Then she was full of fire and fury. First, she scolded the so-called sister. Then she turned on the woman who was bent upon breaking the poor hapless Khadija’s bangles and gave her a piece of her mind. She thundered, "Why must the woman alone be referred to as so-and-so’s widow? Why is a man not called someone’s poor widower? And why aren’t his watch and spectacles snatched away and broken immediately after he becomes a widower?" Even during periods of extreme financial crises, she never spoke of her problems to anyone. Nor did she complain of the indifference of her friends, and continued to play cards with close friends at parties with extreme dignity, even when her personal affairs were a mess. "I got up early in the morning. The entire household was asleep. Their Pandit arrived. The poor chap sat anxiously in a room. He said the time of the mahurat was about to be over and no one was around. 'How shall I begin the rites?' I said, 'O Panditji — why do you fret? I can begin the puja for you.' That’s it! I sat down and got the ceremony going." I was surprised and asked, "How did you begin the ceremony?" To which she said, "What was there to it?" The pandit said, 'I will recite the mantra and you keep throwing rice in the fire.' I kept throwing rice and shortly the rest of the household arrived — that’s all." An American scholar, perhaps Carlos Coppola, had come to Bombay. One day he informed us, "Nowadays Ismat Apa is quite taken up with Imam Hussain". Then I noticed that during the month of Muharram, Ismat Apa would attend majlises5 held at the women’s Imambara, dressed in a black blouse and black sari, listening with rapt attention to the narration of the trials and tribulations of Imam Hussain. She exclaimed, "He was amazing! What an amazing person Imam Hussain had been! Look at all that he had accomplished!" 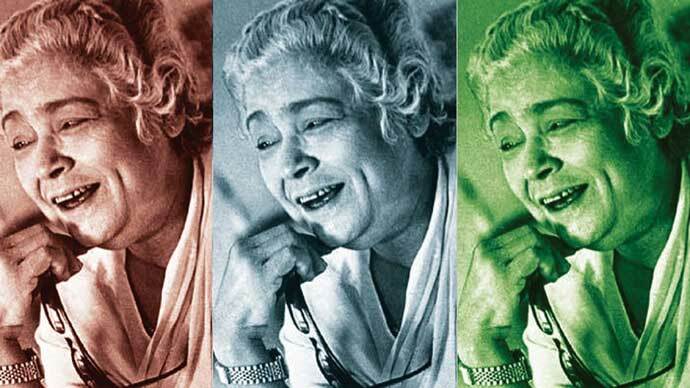 No one knew how she had developed an interest in Imam Hussain but, from then onwards, Ismat Chughtai was frequently seen attending congregations dressed in black and became very popular amongst the Shia community in Bombay. Everyone seemed extremely impressed by her "Hubb-i-Ahle-Bait" (love for the members of the family of Imam Husain). She explained, "I am actually rendering Mir Anees’ Marsiyas ('Elegies') into prose." Subsequently, her book, Ek Qatra-e-Khoon, was published. I did not meet her for many years after this. However, the exaggerated manner in which people would refer to the state of her mental decay, particularly during the last three years of her life, revealed a strange aspect of human psyche to me. Generally, people pray for the long life of a child — "May you live long!" — this is considered the best form of blessing. Everyone wants to live long, but when someone else reaches the stage when memory grows weak, she/he is immediately declared senile. Ismat Apa’s memory had grown weak, and people began to make fun of her saying, "She has turned into a four year old now — she has begun to play with dolls, et cetera." But this was not true. When we poke fun at other people’s old age and its related problems, we forget that if the prayers of our elders are realised, we too will reach a stage when we will be thought of as ridiculous or that the mention of our names will be a source of mirth for others. This is frequently heard: "So-and-so? O, so he is still alive? That’s amazing! Hee-hee-hee! He (or she) is well past his (or her) shelf life." Ismat Apa would often say, "I am very scared of the grave. They bury you beneath a pile of mud. One would suffocate." Once I asked how one could choke when one was not breathing. "Oh no! How do you know, your breathing may come back anytime. I’d rather be cremated." It was to Ismat Apa’s credit that she actually practised what she preached. It was reported that, when Majrooh Sultanpuri and others reached the Chandanwadi graveyard on hearing the news of her death, they discovered that her body had already been consigned to the crematorium. She had instructed that no one be informed of her death and that she be immediately taken to the crematorium. Indeed, what a strange woman! A jovial and compassionate Ismat Chughtai had limitless capacity to put up with bores. One cannot do full justice to her complete personality in such a brief article. Where can one find such a unique human being and exceptional writer like her now? Her remote ancestor, Chenghez Khan, lived in a mobile tent which had a golden dome. His army on wheels and horseback was called the Golden Army, "Urdu-e-Mualla", because their tents had golden canopies. The word "Urdu" is derived from Urdu-e-Mualla. Ismat Chughtai inherited the special Urdu spoken by ladies — sharp, witty, and picturesque. She used it spontaneously in her stories. That particular inimitable style, which was Ismat’s own, has passed away forever with the passing away of Ismat Khanam, Lady Chenghez Khan. - Translated from the Urdu by Deeba Zafi. Qurratulain Hyder was a prolific Urdu novelist, short story writer, academic and journalist.